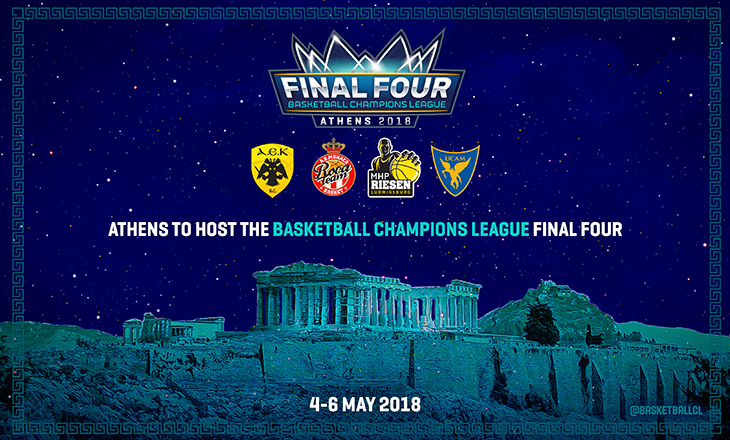 The city of Athens has been awarded the hosting of the 2018 Basketball Champions League Final Four. Four teams, representing four different countries, will be participating in the pinnacle event of Basketball Champions League’s second season which will be played over the first weekend of May in the Greek capital. The games will be played in the OAKA Olympic Indoor Hall (18'000 seating capacity), regular home court of AEK. The Greek host, currently in the 3rd position of the Greek League, is having an impressive year, recently winning the Greek Cup against Olympiacos, finishing the Regular Season of the Basketball Champions League at the 3rd position of Group C, and then eliminating the Czech champions, CEZ Nymburk, and the French runners-up, SIG Strasbourg, in the Round of 16 and the Quarter-Finals. The other three qualified clubs complete a very competitive Final Four line-up with AS Monaco, currently 1st in the French League (tied with SIG Strasbourg) and recent Leaders Cup winners, MHP Riesen Ludwigsburg, currently 3rd of the German BBL, and UCAM Murcia, currently in the 10th position of the Spanish ACB. "We’re very excited to have Athens host the second Basketball Champions League Final Four. We have witnessed the fervent enthusiasm of the club to organise this historical event and the passionate support of the local community. We are all thrilled to have the opportunity to award this Final Four to such an impressive environment, where the participation of four clubs that are currently ranked in top positions in four of the most competitive leagues guarantees a unique weekend for basketball fans across Europe," said Patrick Comninos, CEO of the Basketball Champions League. The Semi-Finals will be played on 4 May, with the Third-Place Game and Final scheduled for 6 May. The draw determining the pairings will be held next week, on Thursday 12 April in Athens.